Congratulations on your pregnancy and thank you for reading this post and considering us as your baby’s newborn photographer. 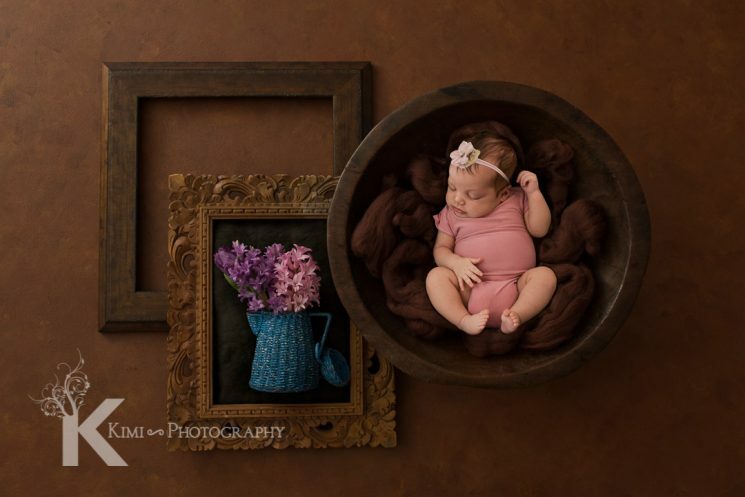 Kimi photography provides fine art newborn photography in the Portland area. Some people may think what does fine art newborn photography mean? 🙂 In general, I think newborn pictures are all pretty and cute, because all babies are cute. They are not the hardest subject to take pictures of, right? However, fine art requires a photographer to have some tricks and techniques in order to create an art piece that you would like to have for generations. On this blog post, I will show some images just out from my camera and the final edited images that I prepare for my client’s ordering sessions. The first image is how I capture this picture. The one below is after editing. Moms dealt with so much pain during the delivery. Also babies went thorough so much when they come to this world. Some babies come with rough skin and acne, some come with birth marks etc. Usually, I clean up the rough skin and acne for the final images unless my client request to leave them. The signature editing is included in the sessions with Kimi Photography. Baby skin also has a lot of color shades. In my studio, we have captured many babies of different race from all over the world and a lot of mixed cultured babies. This baby who has lighter skin color had some pink and blue spots on his eyes and thin area, so I even them out for the final image. On this picture, the parents requested me to leave the red birth mark on his forehead that he was born with. This is another before and after. This picture shows the baby’s face more clearly. Right image is before and left one is after I edit it. This is a sample image of composing images. Newborn babies are so flexible and fragile. There are some techniques that require letting them pose. Especially, when the baby has to hold their head like this pose we compose images to make the final. Why? Safety comes first at Kimi Photography. We don’t force babies to pose in uncomfortable or unsafe ways. There are a lot of poses and ways to capture babies with safety. Photoshop techniques help in creating fine art newborn pictures and allow babies to be themselves. I always try to crate something unique and artistic. I usually set up 3-5 sets and scenes with props for newborn sessions. Some babies sleep only for short time, some babies sleep through out the session. We planned to compose, and we took this picture to create the final image. Images just out from the camera are not bad, but to make fine art that you would like to keep for generations and share with your family and friends, these are some of the processes that we go through! If you are looking for fine art newborn photography in Portland, Please contact Kimi Photography!